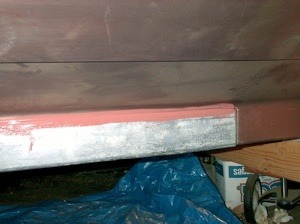 The lead ballast is a pretty simple affair for this boat, just a 4 inch square section about 56 inches long. 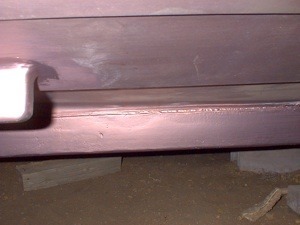 The lower edges are radiused to match the deadwood. This shot shows the forward end. I've left a uniform gap at each end that I'll fill with sealant and will serve as an expansion joint. I don't know if this is necessary, but with a temperature range of -40 to +40 C, I wanted to be on the safe side. �I made a ramp to slide the lead off the back of the truck which was luckily alongside the boat's� cradle. 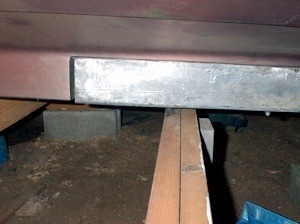 From there I lifted the ballast onto the bearers I had added under the cradle (one shown�above) and finally worked it into position where I drilled the 1/2 inch holes and recesses for the nuts. The view from below showing the recess with the bolt, nut and washer being tried in place. The plans showed a centered bolt pattern, but mine came out alternating on either side of the centerline, fortunately in the correct sequence. 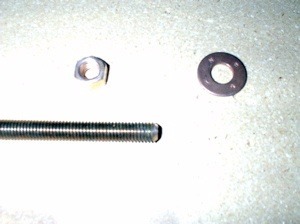 For the keel bolts I'm using 1/2 inch threaded bronze rod with bronze washers and nuts. A small chop saw makes this step easy. Note that a taper has been ground onto the bolt end to make threading on the nut an easy job. After finally getting some 3M 5200, I've mated the lead ballast to the boat once and for all. This was a horribly sticky and messy job, so pictures were limited to those moments where I was changing gloves! 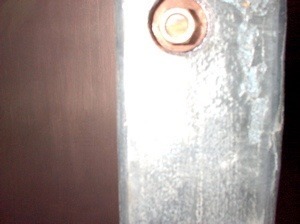 I used two long steel threaded rods in the end bolt holes to control the placement of the ballast. 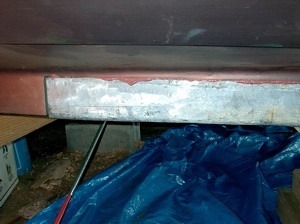 These made sure the lead keyed into place correctly while lowering and raising it with a hydraulic jack. Once the ballast was in place for good, I added the bronze bolts and snugged it up. Some squeeze out shows that I shouldn't have a dry joint anywhere. A closer look at the squeeze out. It was just about the right amount for a nice fillet. �I chose the "mahogany" colour because it seemed less jarring than white or black. Finally filleted and the excess cleaned up somewhat. I didn't want to remove too much, just in case. 3M claims that it is sandable, so I'll wait for a full cure and try some sandpaper. All that remains is to shoot some sealant into the small gaps at either end of the lead. Once the lead is sanded to brighten up the metal somewhat for good adhesion, a couple of coats of resin and hardener is applied. 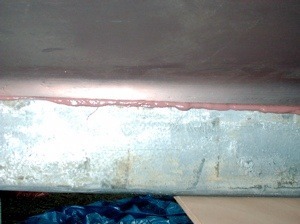 While the resin is still “green” the bottom paint is applied ensuring a good bond to the resin.